They look great in modern planters. Supplied in a 14cm pot, with a minimum of 8 fronds emerged, protect from cold indoors in winter. A real relic from the dinosaur age, this really does look like a lush prehistoric forest plant, but makes a wonderful textural and architectural plant that is easy to grow. Called the Sago Palm, it is a member of a very old type of plant called a Cycad. It looks perhaps a little mroe like a fern, but the tough fronds are much more rigid. Very slow growing, it slowly forms a trunk over many many years. Grow it indoors in winter (they tolerate low light well as they almost shut down in winter), as it is damaged by frost, but they beneft from a Summer holiday outside on the patio once frost risk has passed. Water them well outdoors, as this is when new fronds emerge for the year. They look great in modern planters. Care - there are reports they are harmful to dogs if chewed. This is common to lots of plants, but this one seems to have attracted some bad press. 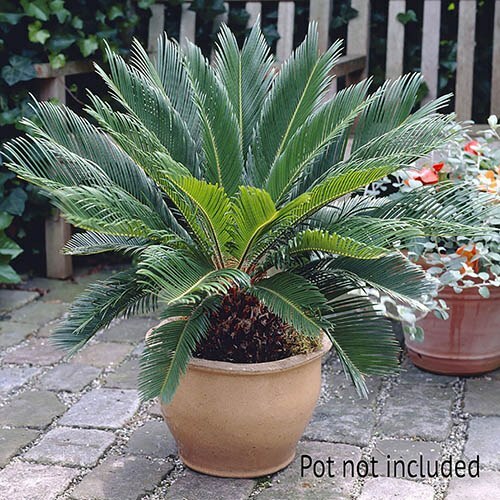 Supplied in a 14cm pot, with a minimum of 8 fronds emerged, protect from cold indoors in Winter. Care - avoid places where dogs can chew it, as reported to be harmful to them.